Sightseeing in Kathmandu valley and trip preparation . Sightseeing of the Kathmandu valley. Start our journey across Tibet. Overnight at the Tibetan border town of Zhangmu in guesthouse. The road winds upward just after Zhangmu till we reach Sefo La (16,900 ft). From here a majestic view for the Mount Shisapangma can be seen. Then descend down to the plain of Tingri. On a clear day the panoramic view of the Mount Everest from here is breathtaking. Further 50 miles drive brings us to our night-halt at shegar (13'800 ft).Overnight in a very simple guesthouse. On the way to Shigatse we shall make a detour of 16 miles to visit one of the most important Monasteries of Tibet –Sakya. Further 100 miles drive will bring us to Shigatse, the second largest town of Tibet. Overnight in Shigatse Hotel. In the morning visit of Tashilhunpo monastery, built in 1447 by the 1st Dalai Lama. Tashilhunpo in one of the most imposing construction of Tibet, which housed at one time more than 2000 monks. Afternoon free for wandering around the local market. A very long, but enriched with sceinic beauty, drive lies aheadof us. After 56 miles we reach Gyantse, situated at the junction of the ancient trade route between Sikkim, India and Lhasa, where we shall visit the palkhor monastery and the beautiful Kumbum stupa. Proceed further along the Turkish blue yamdrok Lake over two passes, Karo La (16'500') and kampa La (15'800') and finally along the southern bank of the tsanpo river to reach Tsetang. Overnight in Tsetang Hotel. Excursion to yarlung valley. Enroute visit the reconstructed monastery of khrabung, one of the oldest monasteries of Tibet. In the upper part of yarlung-valley lie the tombsof the kings of Tibet dating from 7th till 9th century. These tombs have not been excavated, hence we shall see only the outer part of the tombs. After lunch visit the Yambulhakhang, originally the oldest building of Tibet. This temple was destroyed totally during the cultural revolution and has been reconstructed in its original form. Drive along the Tsangpo River for 20 miles and then cross the river by ferry. From the north bank of the river we undertake the further journey Samye by tractor (approx. 45 minutes). This monastery was built around 770 by Padmasambhava himself and is till today one of the most important monasteries of Tibet. A 4 hrs drive from Tsetang will bring us to Lhasa (12'500 ft).Overnight in Hotel. We shall visit the Dalai Lamas fable winter residence –the Potala palace, the jokhang temple,the holiest spiritual center of Tibetan Buddhism, Norbulingka-park, the summer palace of the 14th Dalai Lama. Besides the important monasteries of Drepung and Sera we shall also visit, time permitting, the monastery of Garden, 37 miles east of Lhasa. This monastery was totally destroyed during the Cultural Revolution and is at president under re-construction. The situation of this monastery in the form of an amphitheatre alone makes the excursion worthwile. 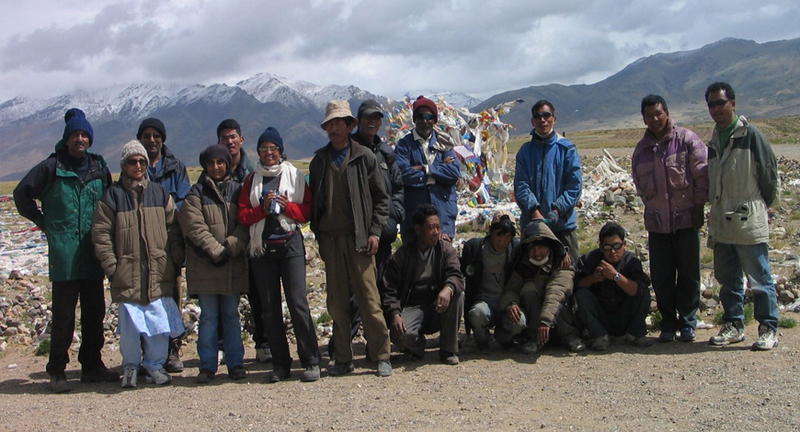 Leave Lhasa and drive in northern direction for about 8 hrs to reach Nagchu. Visit the newly reconstructed monastery of Nagchu which houses a tantric as well as a Tibetan medicine center. Overnight in a newly constructed guesthouse. Today's drive takes us only about a hrs. We rarely come across any settlement on this stretch. Overnight in a very simple guest house. This day's drive will take us over 3 passes reaching the highest point of the expedition at Tang La (17'500 ft). The settlement of Tuo Tuo He lies at the source of the Yangtsekiang river at 15'100'. Overnight in a simple guest house. On the way to Golmud we cross two passes at 16'500' and 15'900' respectively. Golmud lies in the Qinghai province which was previously the northestern Tibetan province Amdo. Here ends the railroad coming from Xining. Evernight in Golmud Hotel. These two days we drive through a rader unknown territory to the foreign tourists. Instead od driving east towards Konor Lake we continue north through the Changtang area over the eastern flank of Kun Lun range. We leave the Tibetan inhabited area and reach the desert region at the border of Gansu and Sinkiang province. After the experience of the Tibetan world we rich another highlight of the journey, the MogaoDunhuang caves, carved in a 1,5 mile along rocky hill. A world of unique sculptures and paintings dating from 5th till 14th century can be seen in the 30 caves which are open the tourists. The cave of Dunhuang in itself are worth a journey. The oldest rock sculptured chapel, called Mogao after its discovery in 1899 dates back to 366. Another 120 caves date back to the 5th and 6th century (northern wei-and sui-Dynasty) and another 200 caves belong to the Tang-Dynasty of 7th till 9th century. The desert oasis Dunhuang was once upon a time a watchpost of the main roads to central asia. During the invasion of the muslims in 15th century the silk Road was shifted more through northern areas and pilgrimsage center lost its importance. Overnight train rode to Lanzhou. Arrive Lanzhou in the morning. Depending in the arrival time of thetrain we shall visit the archaeological museum of Lanzhou. We continue sightseeing in Beijing. Day 28- Fly home from Beijing.